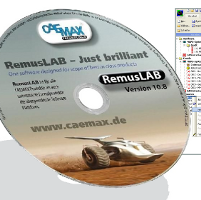 RemusLAB is the universal software platform which allows the configuration and control of all CAEMAX measurement hardware as well as of supported third-party systems. For the first time Dx telemetry, MOPS, CAN interfaces, OBD VarioPRO, CLS, WFTs and additionally supported USB devices can be synchonized by one single configuration software only. Despite the most complex hardware functions RemusLAB offers unique ease-of-use.